In a LinkedIn thread, the issue of organizational improvement was raised and I commented about the reality that continuous improvement was something that many managers strive to achieve, once! CONTINUOUS continuous improvement, on the other hand is simply continuous, by definition. I joke about getting the idea of that phrase from the Department of Redundancy Department but that is really just a joke to make the phrase a little more memorable. It IS a real issue. It was a common comment in discussions with managers who when we were implementing quality improvements years ago. ONE improvement was enough for many of them, since change can be risky in their perceptions. In reality, NOT changing is the risky behavior. Checking off “continuous improvement” on your competency sheet is not what it is really about. Improvements are necessary for organizational survival. By implementing innovations and improvements, we pave the road forward for more innovations and improvements. The Round Wheels of Today will be the Square Wheels of tomorrow. 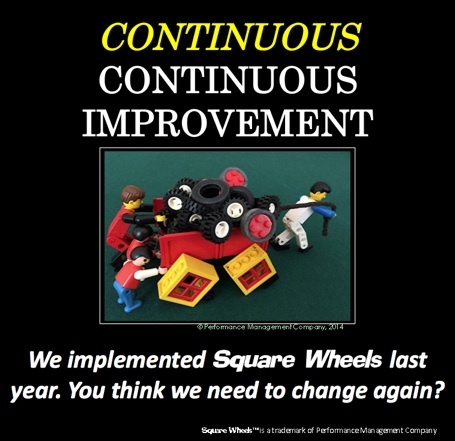 So continuous continuous improvement is a simple business reality. Since less than 50% of the workforce is engaged, there are plenty of opportunities to move things forward.